One of the huge outreach programs that my library does is the Kindergarten Party. Basically we visit every Kindergarten in the county and send home library card applications. Every application that is returned equals an invitation for that child to attend the Kindergarten Party where, with great pomp and circumstance, we present them with their very own library card (among other fun things for them to do that day at the library). I personally presented to a total of about 250 kids during November to promote the program. 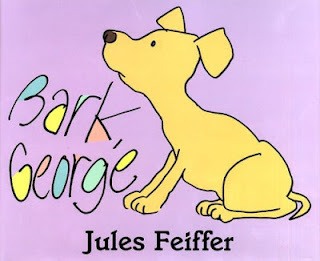 Most of the classes were strapped for time so we sang one silly song, read Bark, George by Feiffer, and then I told them about the party. This month, my coworker was doing a search for a young boy. When she asked for his card, his dad joked, "We'll be back in three weeks then." I knew that the Kindergarten party was three weeks away, so I asked the boy if he was going to attend. He looked at me in that super-suspicious way that kids do when they suspect adults are messing with them. "How did you know that?" I said, "It was probably me who visited your class and told you about the party, what school do you go to?" After he told me what school and I knew that it was I who had visited I said, "Yeah! 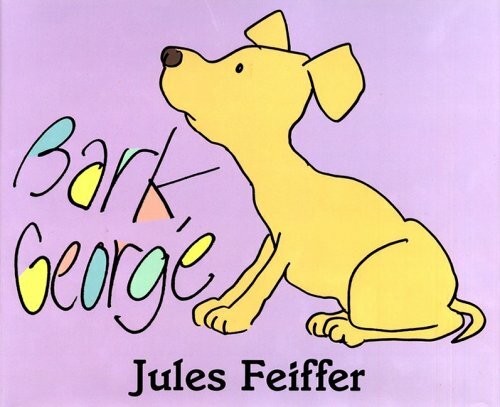 It was me who came to your class--don't you remember when we read Bark, George?" Friends, his whole face just lit up as soon as I mentioned Bark, George. "I know you!" he said with a huge grin. I believe I made a difference in those kids' lives, however briefly. I believe that Jules Feiffer himself would have been proud of how I hammed up the reading of his book. I believe that that book will have a special place in many of those kids' hearts from now on. I believe in what we do. *And then I melted into a puddle of goo on the floor. I'm melting just reading your post. Really, really great to see these live and in action moments on the ground floor from children's librarian after there being so much negativity the last few days about what children's librarians do. I love the idea of the Kindergarten party! What do you do for the Kindergarteners that might already have a library card? And THAT makes the job ALL worth it!